There is a long and very strong tradition of the concept of the Islamic garden throughout the Arab world. It is also a well understood concept in the West, though from a slightly different perspective, perhaps because of our lack of a real comprehension of its roots in Islam. Because of the way in which we in the West tend to understand Islamic gardens, it is important to make the distinction between the more classic view of the Islamic Garden and that relating to the gardens of the Arabian peninsula. There is a lot of literature relating to landscaping, and I recommend that anybody interested in this subject should comb libraries, bookshops and, of course, the Internet, to see what they might learn. With regard to Islamic gardens I believe it’s particularly important to have a wider perspective, which is why I will digress a little. The introversion characteristic of houses in Islamic towns was reflected not only in the development of buildings, but also in the manner in which landscaping was treated. The Islamic town concentrated attention on the internal development of the house, an arrangement which focussed particularly on the courtyard, while non-conforming and anti-social land uses were located on the outskirts of urban developments. In the often harsh climate, landscaping was developed within this contained area in a manner reflecting the relationship between a Muslim and his religion. This introversion is touched on elsewhere and is one of the keys to understanding Islamic architecture and, especially, Islamic garden design. In essence, the relationship begins within the private areas of the household, and proceeds outwards from there. By contrast, later western design had no compunctions about exposing its designs to the wider world. Certainly there were many gardens with a strong religious component to their work and notional relationships, but the designs with which we are now most familiar tend to be the larger gardens, built by or for people with considerable funds to establish gardens, some of which they would never live to see fully developed due to the time taken to establish them in their maturity. These were not introverted designs. They were ostentatious designs, designs to be seen by peers and others, designs to impress: the antithesis of the thinking behind Islamic designs. However, pre-dating these gardens there was a type of garden known as hortus conclusus. This literally means an enclosed garden. This type might be considered to have developed early and been overtaken by the more open character of gardens around the fourteenth century. It would be logical to consider that the earliest horti conclusi developed with the need to provide a secured food supply in uncertain times. They would have been contained by an appropriate enclosure to guard against incursion by predators and nature while providing optimal conditions for the contained planting. These gardens were often associated with fortified developments as well as monasteries, all or most of which building types would have contained the gardens. While those gardens may have been considered functional in that they supported the lives of those living in the associated developments – and in the case of monasteries, would have also supported medicinal planting as well as fulfilling religious requirements for labour – earlier Graeco-Roman traditions saw their gardens more open to the surrounding landscapes and were areas devoted to pleasure or political statement with access to guests, the gardens often typified by ornamental pagan statuary. From around the seventh century the hortus conclusus evolved into a more private and spiritual place where those living adjacent to it would have had access to a setting in which they might experience divine or even romantic love. The gardens were seen specifically as places of retreat from the cares and troubles of the day, and became the settings for the development of designs of sublime delights, to be enjoyed by individuals and with more privacy than was enjoyed in the Greek and, particularly, Roman traditions where gardens were designed for solitude but later developed into more public spaces often associated with recreation and exercise. In these early gardens there was a strong symbolic link with Christian traditions, particularly with allusions to the Virgin Mary and the Song of Solomon and the latter’s allegorical linking of the garden with the relationships between bride and bridegroom. This was developed with suggestions relating to the Immaculate Conception, specifying elements of the contained garden such as a tall cedar, a well of living waters, an olive tree, fountain and a rose bush, though not all of these might be sensibly comprised within an enclosed garden. Nevertheless, it is interesting to compare the physical specification of containment, water and planting with those of an Islamic garden; the medieval garden being based on an enclosed space with four paths and a water feature associated with baptism as well as having a functional use. The Western landscaping with which we are now most familiar tends to be the formalised terraces of Italy and France, with their dominance of man over nature, or the exaggerated naturalistic styles of England. There is, possibly, a precursor by two hundred years to the naturalistic English gardens at the Villa Lante, Bagnaia, Italy. These gardens visually stretched away from the house in attempts to dominate or make monuments of nature and focus attention on distant sculpting of the landscape, an exercise which took considerable effort in terms of men and horsepower. As mentioned earlier, it is important to consider that, because of the scale of the planting, the designers and owners would not have been able to see the full fruits of their exercises in their lifetimes but must have had the self-confidence to create settings for future generations. Perhaps William Kent is an exception in that it can be argued he took considerable pains to create visual links between house and surrounding landscaping, though he and those whom he influenced, were more concerned with visual effect than practical coordination. In this there is a distinct difference between concentration and focus on nature as an aesthetic interpretation of perfection, and nature as an interpretation of paradise – an aesthetic, compared with a reflective exercise or pursuit. It might be useful to look briefly at Chinese and Japanese garden design as it may be thought there is more of a link between them and Islamic garden design due to the religious component of the two types. The bases of Chinese and Japanese garden design are extremely complex and I can’t say I understand them. What is written here is only done so in order to give a bit more context to what is written about Islamic garden design, so that it is not seen just by comparison with Western garden design. Chinese gardens historically pre-date Japanese gardens which derived from them, perhaps via Korea. I understand that the essential differences are those caused by their being based on different religions: Chinese gardens were rooted in Confucianism and Taoism, whereas Japanese gardens were more strongly influenced by Bhuddism. In addition to this, Japanese gardens are thought to have had a stronger religious basis than had Chinese gardens. The Chinese house and garden were seen as unlike in character and were meant to be used differently by their occupants. Not only were they of dissimilar characters, but this difference was consolidated by the physical link between them being structured and strongly defined by doors. In this they might be regarded as similar to many Western gardens, regrettably. It’s possible that the difference might also come about from the house being seen to be different and separate from nature. But Chinese gardens were meant to be enjoyed and lived in, perhaps more as a functional element of the household’s pattern of living. Nor was there the same degree of religious spirit to the Chinese garden compared with its later Japanese cousin. There was, however, a very strong link between painting and the garden brought about through the Taoist influence with its awe of nature. Confucianism had much to do with relationships rather than laws and is seen to be humanistic or even agnostic in its essence; in fact Confucianism and established religions are not mutually exclusive and, for two thousand years, Confucianism was the main doctrine of China. Taoism, its partner, deals with balance and harmony but is, in a sense – and in contradistinction to Confucianism – more anarchic in its support of the individual or natural societies and not the insitutionalised societies promoted by Confucianism. Japanese gardens developed to a large extent on the concepts noted above. The philosophical or religious basis of Chinese gardens were adapted and developed in a manner suited both to the smaller sites available in Japan, the colder climate and, of course, the different socio-religious circumstances. Japanese gardens were, like Chinese gardens, an attempt to create a utopian space suited to relaxation and contemplation, a space that could be used and enjoyed, particularly by those living in troubled times. Although they were an artificial creation, they were a setting for those who had a need to reflect. But more than that, as an adjunct to a living area, they were a means of introducing calm and order into the lives of those using and enjoying those living areas. In considering Oriental gardens it has to be borne in mind that the vocabulary we in the West use in their design – such as form, texture, sound, motion and colour – are not as important in design and enjoyment as aesthetic – philosphical and religious – and symbolic elements. These are key concepts used in the overall composition of the garden and might not be looked for by a Western observer. In this I believe there is some similarity with Islamic design. Almost every Japanese garden incorporates elements relating to water, islands of stone, plants and garden accessories, elements that relate to Japan and the development there of Zen Bhuddism introduced in the thirteenth century. The late Dr. Kawana described the Japanese garden as having a number of intrinsic features: symbolism, aesthetic and design, though I have expanded the description to include elements described in another essay on Zen and its relationship with the Japanese garden. Water and islands are features symbolising the islands of Japan and the surrounding sea fed by its rivers, though it is not important for water to be actually in the garden: water features may be created with dry materials. In fact, although Japanese gardens might be divided into those that are dry and those that are wet, the former almost always have a small amount of water in them. Symbols of auspiciousness and longevity are often incorporated into gardens. Cranes, tortoises and pine trees are three such symbols of longevity, and the pine and bamboo are symbols of auspiciousness. seijaku or the attainment of stillness, quiet, and tranquility. reflects the variety of philosphical and cultural characteristics of the Japanese. neither of these use any form which could not be seen in a natural situation and, generally, they must also be entered to be experienced. This latter requirement gives rise to the use of fences and screens to define, focus, hide and reveal. the use of plants to block near-by, non-natural elements and focus the viewer’s eyes on far, natural elements, a concept known as ‘borrowed scenery’ as it effectively incorporates external natural features as elements within the owner’s private garden. You will see from the foregoing that the concepts behind Japanese gardens are completely dissimilar from those generally employed in the West or in the Middle East. The essential design requirement is to ensure that the viewer or user of the garden is drawn into the garden, to have empathy with it to the extent that his imagination extends its physical boundaries. These different concepts are not a vocabulary from which a selection may be made for a particular garden; they have all to be employed in the design of any garden. The elements of design set out above will give much of the design character required of the Japanese garden, but different features should not appear to be manufactured or man-made, but should seem natural and evolved over time. In this regard the markers of the passage of time such as weathering, moss and discolouration should also be employed. Elsewhere I noted that Islam swept outward from Arabia, establishing itself over a large geographical area in which a variety of societies and traditions pre-existed. As a consequence, the architecture and landscaping which then became known as ‘Islamic’, demonstrate a wide diversity of styles responding to those geographies, climates and societies, while overlain by a number of ideals specific to Islam. In short, Islamic design varies, though is linked by a common unity of spirit. And this applies, of course, to Islamic gardens, though I’m likely to make a number of generalisations in attempting to sum this up – for which I apologise in advance. There is a strong association between the concept of Islamic gardens and paradise. The Persian word, pairidaeeza, is a combination of two words that mean ‘surrounding wall’, thus the concept of paradise is of a garden or gardens, surrounded by a wall, isolating those within and enabling them to enjoy the features established within the wall. The word ‘paradise’ is derived from the Persian, pairidaeeza, arriving in English via Greek and Latin. In Arabic the name for a heavenly garden is jannah, of which the highest level of garden is firdaws, most commonly used in the phrase jannaatal-firdaws – gardens of paradise. The characteristics we associate with Islamic gardens are mostly based on Persian gardens which existed before Islam moved out of the Arabian peninsula. 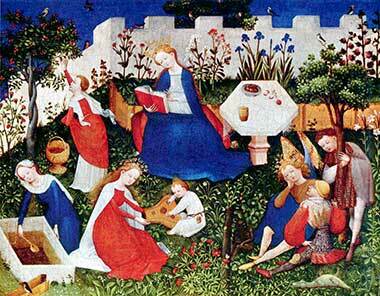 The concept of Paradise being a garden pre-dates Islam, Christianity and Judaism by thousands of years. Originating with the Sumerians, paradise gardens were also a feature the Babylonians reserved for their gods, introducing two of what were to become basic elements of an Islamic garden: trees and water. With its adoption by the Greeks, Paradise became associated in the Abrahamic religions with Heaven. By contrast with Western landscaping, but with some similarity to Japanese, Islamic landscaping was introverted and miniaturised in some parts of the Islamic world where it set out to represent the paradise described in the Holy Quran. Not only that, but the injunction against naturalistic representation in Islam generally avoided the psychological projection of the viewer from the site by omitting designed references to objects found outside the site. 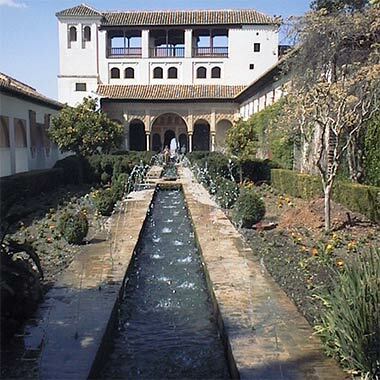 This relationship of landscaping with architecture was essentially reflective, perhaps being best epitomised in the Western mind with the development of the Alhambra in Granada, carried out at a peak in the development of arts and thought in Islamic Spain. In particular the use of water as an essential element of the design – perhaps more important than planting – demonstrated a sophistication and sensibility to the introspective nature of Islam that has rarely been matched. Views from the Alhambra permitted sight of the outlying scenery and, in this manner, reinforced the delicacy of the interior development of the palace, and its containment and relationship with nature. Some experts believe it to be the most perfect marriage of buildings with internal and natural landscaping. Having said that, the Alhambra we see today is the product of later development. Following the success of the reconquista which saw Christian Spain retake Granada and the Alhambra in 1492, the Alhambra was left to deteriorate for a long period of time and was only brought back to life in the last century under the combination of an increasing number of European travellers and Victorian romanticism. Because of this we can not guarantee that what we now see replicates the original design. One final note on the Alhambra is that it, together with buildings such as the Chehel Sutun pavilion in Isfahan, demonstrate the blurring of internal and external spaces, a feature not just of buildings in hot climates, but where philosophical ideals create the conditions which join man with nature, and reflect this in their structures and planting. Before I leave this area I should also mention Mughal gardens. Earlier I noted that Islam moved out of the Arabian peninsula and, adapting traditional Persian gardens, introduced them to Moorish Spain in the West and to the Mughal Indian sub-continent. Although Moorish and Mughal landscaping were not coeval, they represented local developments of design under Islamic influence. Both are regarded as incorporating Islamic gardens which, of course, continued within Persia and elsewhere. The Mongols moved into Persia in the thirteenth century, then on to the Indian sub-continent taking with them the concept of the Islamic garden with them, gardens referred to as Mughal, perhaps the most famous being the Taj Mahal. There is more about Mughal gardens on this website and, for those with a particular interest, the site’s bibliography is likely to be useful. the arid geography of much of the area in which Islam developed and gained supremacy. a subject I touched on previously, relates to the need to maintain a balance of man with nature, and neither to impose a form of rational will on nature as occured in France, nor to submit to a concept of nature as happened in England. These appear to be the basis on which the older, traditional Islamic gardens were premised, as well as forming a proper basis for new design. …in it are rivers of water incorruptible; rivers of milk of which the taste never changes; rivers of wine, a joy to those who drink; and rivers of honey pure and clear. These four rivers tend to be brought together at a central fountain or pool, a feature and focus of the garden. …wherein are two fountains flowing. and these concepts, both conceptually and physically, are central to the use of water in the garden. …We shall admit them to shades, cool and ever deepening. The Holy Quran contains many references and allusions to the features of the gardens that await the faithful. But it is not just shade that it promised. Coolness, lush greenery, fruit and beauty are also features of the garden. These help to create a setting for rest and enjoyment, providing fruits and shade, colour and movement. But those who keep their duty to their Lord, for them are lofty halls with lofty halls above them, built (for them), beneath which rivers flow. (It is) a promise of Allah. Allah faileth not His promise. These pavilions are specified as being elevated and constructed over running water and from which good views of the gardens are to be enjoyed as are, of course, the pavilions themselves and the life lived within them. the walls mark ownership, establishing the area as special in some way. To relate this to the Gulf and the present, visiting one of the many farms in the desert is an interesting event. Approach is made across the open desert where the farm can first be seen as an isolated object, and an increasingly welcoming sight. Entrance is relatively dramatic in the change of environment and, having entered, it can be difficult to imagine what the desert outside is like, so pleasant is it within the farm. Although the purpose of a farm is different, the combination of water, plants and a place to sit and enjoy them is something that can easily give a foretaste of the paradise to come. There must be an element of this understanding in the psychological feeling that Qataris have to their farms and gardens. In previous paragraphs I have mentioned the introversion of Arabic and Islamic societies and its reflection in Muslim architecture. This is both a socio-cultural aspect of traditional life, but also relates to the preponderance of situations where the architecture is located within harsh environmental conditions. In a sense this introversion is also reflected in the designs of traditional gardens as Arabic and Islamic gardens were designed and enjoyed for reflection and retreat, in a more passive sense than were Western gardens. They were settings for contemplation rather than active enjoyment, but it has to be borne in mind that their physical setting, and the relationship between the garden and viewer would have a strong bond based on the understanding of the Holy Quran. In particular, heavenly gardens are held out as reward to the faithful, and the construction of gardens on earth will have this resonance on those who use them. So far I have described the elements that go to make up our vision of a traditional Islamic garden, but have done so without describing the physical layout. Perhaps it would be useful to set out a basic form, starting with one of the best known types. The chahaar baagh type of garden is so called for its name in Farsi, four gardens, also termed chaar baagh in Urdu. As the name implies, the garden is focussed inward and established on a quadripartite form, preferably with watercourses served by a central fountain running at right angles to each other and separating the garden into four discrete areas. Ideally the garden is enclosed by a building or natural form, but establishing a relatively neutral background to the importance of the garden itself. The container might be in the form of a wall or tall hedge, the garden itself perhaps a courtyard. The watercourses may be joined or stop at the periphery of the garden, and paths should allow access around the garden and over the watercourses. Generally commentators remark on the importance of the water and green areas acting in counterpoint to each other, but the hard landscaping and enclosing elements are just as significant, as is the sky which has increasing value as the proportion of height of containing walls to length and width increases. This sketch illustrates how the above description might be organised in terms of a notional design. The key elements of water, greenery and paths arranged within a quadripartite geometry can be seen here in a very formal disposition. This formality is one of the characteristics of Islamic gardens when compared with Western or Eastern traditional designs. It has also been a feature of Islamic architecture, particularly in its integration of buildings with landscape. Here there are no buildings shown associated with the garden but, if there were, then you would anticipate an integration of the two, particularly at their interface where arcades of covered spaces were traditionally used. It should also be noted that the incorporation of water and its display was also a function of wealth. Although its use in arid climates was beneficial in practical terms, not everybody could afford to have fountains and watercourses along with the attendant practical difficulties associated with the necessary pipework, mechanisms and maintenance. In those cases either the amount of water was significantly reduced or, in the most difficult cases, omitted altogether though, in this latter case, there is the argument that this would not constitute an Islamic garden. In practical terms, there was always a small amount of water incorporated within the garden, either through the use of watercourses or from a small fountain. The benefit of the latter is that it introduces sound as well as movement within the garden, both important aspects that contrast with the surrounding desert or arid environment. The incorporation of planting brings not only its own movement and aromas, but introduces insects and birds into the garden, again resulting in movement and sounds. These are significant elements of Islamic gardens and feature in poetry and the graphic arts of the region. There are a number of famous Islamic gardens. Those usually mentioned include the Court of the Lions in the Alhambra, Granada, Spain, the Garden of Fin, at Kashan, two hundred and fifty kilometres south of Teheran, Iran and the garden of the Taj Mahal in Agra, India. 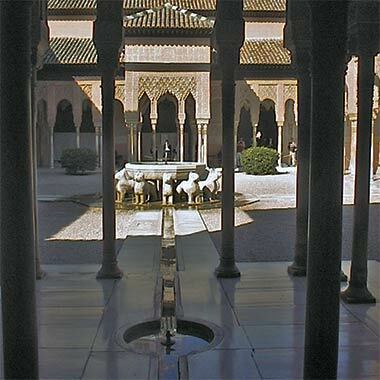 This first photograph was taken of El Partal in the upper Alhambra, Granada and illustrates the relationship between shaded area and a large water resource. Here, water channeled down from the hills surrounding Granada, was used to create a cooling feature that was designed to reflect the building behind it and to be associated with the views into the surrounding hills. Here the symmetry of the building’s façade and the topiary of the hedge contrast with the irregular natural setting. This is a place designed for reflection, both literally and mentally, as well as for enjoyment, though the upper Alhambra was originally occupied by courtiers and government officials. The next two photographs were also taken in the Alhambra, Granada. This first image is of part of the gardens in the Generalife and is included as it is said to be similar to its original design, bearing in mind that many of the elements of the Alhambra have changed over time. These gardens lie to the north-east of the fortified Alhambra, and date from the thirteenth century, as does the building at its focus. The gardens incorporate clipped hedges, grottos, fountains, and cypress avenues, with this complex situated at the north-west end of the gardens from which views across the valley can be enjoyed. The water is led to the gardens and erupts here in a generous and powerful spectacle, its sound echoing from the containing buildings. While not entirely rural, this little complex has far less of an urban feel to it than do those courtyards within the Alhambra itself. Here is the Court of the Lions in the Alhambra, taken down its long axis. It illustrates many of the factors noted above in the requirements for an Islamic garden. Of particularly note, though, is the integration of the surrounding building with the garden, effected by the use of an open verandah. This provides shade from the hot sun and protection from the rain and is both a circulation system as well as a living space. Connected to it are a number of rooms that have multiple uses, some of which have small fountains connected by narrow channels to the courtyard’s central feature, the marble basin with its fountain and associated carved lions. The scale of fountains and channels is more suited to the character of this urban and urbane space. The quadripartite divisioning has been created with the water channels and there is only a small amount of planting. It is notable that even these small shrubs are sufficient to have an impact within the courtyard, though, from the other end of it, the tops of cypress trees can be seen, which also adds to the effect of softening the hard roof lines while contrasting in colour and texture to the carved masonry. While it is only the Court of the Lions above that has the classic organisation of an Islamic garden described further up the page, all three examples above are, of course, Islamic gardens. Here, though, is a plan of the Taj Mahal, the gardens developed in Agra, India by Shah Jahan to commemorate the death of his wife, Mumtaz Mahal, construction beginning in 1632, and with completion sixteen years later. It is a beautiful example of Mughal architecture and one of the renowned examples of Islamic design. There are five constructed elements of the development, six if you include the Yamuna river which separates the better known elements on the right, or south side from the Mahtab bagh garden on the north bank of the river. Studies suggest that the complex was laid out in a complex manner relating to geometries found in octagons and right angled triangles, where the numbers 7, 12, 17 and 24 become important measures. Bear in mind, though, that these are approximations. It might be also useful to mention here that although the number, four, is held in special importance in Islam, so is the number, eight, which is associated with Paradise, and accounts for the use of squares and octagons in these designs. Four of the developments have a quadripartite structure to them, the mausoleum, Rauza-i munauwara, being an exception. The Mahtab bagh garden on the north bank of the Yamuna has a square plan with axial paths crossing at a pond, but at its southern side there is an octagonal pool which, speculation suggests, was located there to reflect the mausoleum on the southern back of the river. The mausoleum is one of the most famous images of Islamic architecture and forms the focus of the Charbagh when approached from the south. Leading the eye to the mausoleum is a long pool flanked by paths and trees set in patterned ground cover and paving. The Charbagh is symmetrically divided into four quadrants, each of which is again divided into four. There is a suggestion that earlier versions of the garden subdivided each quadrant again by four and then, again by four, bringing the scale down to a very personal level. The Jilaukhana, or forecourt, is also divided into four while being rectangular in plan. It was designed as the setting down area for guests where they might be organised before proceeding into the Charbagh and thence to the Rauza-i manauwara. To the south of the Jilaukhana is the Taj Ganji. Originally housing for the workforce needed to construct the Taj Mahal development, the Taj Ganji was converted to be used as a bazaar and caravanserai on the completion of construction work in order to provide a place where travellers and their goods might come and stay while carrying out business. As you will be able to see from this aerial photograph, the mixture of uses was so successful that its continuing development changed completely the design and layout of this part of the overall Taj Mahal. This diagram is of a nominal reflecting pool. I have seen a number of them in Iran and I have placed it here as it seems to me a beautifully simple example of the use of water within an urban area. Situated within urban, courtyard houses, the central feature of the courtyard is a slightly raised pool whose surface is contained by a small wall having a circular quadrant top, its edge forming the outside level for the water. This edge device, or similar modern versions, are now popular on what are termed ‘infinity pools’. In a courtyard setting this fine, plane mirror reflects the sky and surrounding buildings but has the added advantage of having water pumped into it from below, the water spilling over the edge into a surrounding channel and running off to water peripheral planting. The curved edge of the upstand glistens from the water run-off, there is a small amount of sound associated with it, and the surface of the water changes through the day. I should add that, like most water devices, it humidifies, and is best suited to dry, arid regions, and not humid regions. Here is part of a reflecting pool, taken in 1975 in Shiraz, Iran, in a courtyard adjacent to one of the passageways through the main suq. Although this is a classic reflecting pool, in this case there are three fountains, only two of which can be seen in the photograph, which are spraying very fine jets into the air, breaking up the surface of the water and additionally humidifying the air. Nevertheless, there is still sufficient reflection from the surface of the water to enable some of the surrounding building to be displayed. This is the head of fountain in another reflecting pool in Shiraz, Iran and shows in a little more detail the characteristic fine nozzles used locally. The advantages of this is that the heads are conservative of water though more prone to blockage from impurities. Again it is possible to see that there is still a reflective element in the surface of the pool. What can’t be experienced in a photograph is the gentle noise these fountains make, adding another sensual feature to the courtyard environment. Not all fountains are of the combined reflecting pool and mobile character as those above. This fountain was photographed in the grounds of a hotel which was once a caravanserai in Isfahan. The fountain is in three parts, water entering from the top and being allowed to flow over the edges of the two top bowls into the mosaic lined channel at ground level. The top bowl is carved from a single piece of stone and is similar in character to bowls provided at the entrances to masaajid and containing sherbet for those visiting. There is a beautiful example at the entrance to the juma’a mosque adjacent to the Naqsh-e Jahaan maidaan in the centre of Isfahan. Not all pools are of this character. In Iran there are pools designed solely to reflect, as in the case of this large pool at the Chihil Sutun in Isfahan, Iran, here photographed in 1975. ‘Chihil Sutun’ means ‘Forty Columns’, the pavilion being constructed with twenty columns at its front, the number being doubled by virtue of the reflection of the pool. Construction of the park in which the pavilion is located began in the seventeenth century, the importance of water being witnessed in many areas of the park. Note the design similarity with the Alhambra above. This pool is part of a complex water system in the gardens at the centre of an Isfahan hotel which was formerly a caravanserai. By day the pools are used to reflect the trees, plants and two-storey building around them. Simple bridges lead pedestrians over the water as they perambulate around the garden. At night, nozzles in the sides of the pools turn the pools into animated fountains which catch the lights and entertain with their sight and sound. It is similar in many respects to the sketch above which illustrates a notional Islamic garden. For centuries there have been gardens in the Arabian peninsula as well as along the littoral of the Gulf where, watered from underground reservoirs, a variety of staple foods have been grown, particularly dates. But there are few sadder sights to be seen in Qatar than the many farms that have been allowed to go to waste, for whatever reason. This is particularly true of date palms as can be seen in this photograph of dead and dying palms on an abandoned farm. This first aerial photograph of another old farm was taken a little south-west of Doha in 1976 and shows part of a farm apparently in the process of being abandoned when the photograph was taken. All the buildings are deserted and partially fallen down though their arrangement is still apparent. However the palms are still there and, apparently, more or less alive though their appearance stands in stark contrast with the nurtured farms in the centre and north of the peninsula. It is difficult to know if they are still being maintained, but my guess would have been that they were. Compare that with this image of another farm, taken on the same run, and showing both date palms as well as vegetable production between them. The palms are much younger than those above, but it is obviously a working farm with the irrigation system clearly laid out and defining the areas of production. It is also a good illustration of the way in which farms were located in areas of rawdha or sweet soil which was deposited a long time ago, collecting in the gentle declivities of the limestone desert. Each of them has been owned for centuries and are one of the precious resources of the peninsula. There is an image of a more mature garden lower down the page. Sadly, the demolition of gardens, farms and areas of significant planting continues, in the main due to commercial considerations. This particular example is of the al-Messilah garden situated on the Doha Expressway to the west of Doha which, as can be seen in the accompanying two aerial photographs, is of a considerable size. However, it is also in an area that is being rapidly developed as Doha and Rayyan are coalescing. The project has come in for considerable criticism with locals attempting to prevent the ‘luxury spa’ development planned for the site to go ahead. The al-Messilah housing development, which can be seen as the almost square development south-east of the site, has been very popular as up-market housing and might be thought of as a model for the new development despite it being around thirty years old. The area of planting is over 13 hectares or 32 acres in size and has obviously been identified as suited to commercial development. It may be that the planting has problems associated with it that are not readily apparent, but it is interesting that locals have considered the development initiative to be removing a natural resource that they are mainly able to enjoy visually, and that they are prepared to do something about it. The point is that natural resources, whether old or newly developed, are considered by many to be necessary supports to everyday living, relieving something of the strains of modern life. In this there are both socio-cultural as well as religious grounds for the enjoyment of nature. Qataris love gardens. It gives them considerable pleasure to sit with friends or family in a garden or park or – if they are lucky enough to have access to one – a date palm farm where they will talk and eat, both by day or night, the latter adding considerably to the attraction when the skies are clear. This photograph shows a typical holding tank for the water pumped from the underlying aquifers with a second under construction in the distance. The well water is usually very cold but it is led from the holding tanks into the irrigation systems along open ditches where it warms, so avoiding shock to the plants. Sometimes the tanks are supplemented from water tankers when there are difficulties with salination or equipment breakdown. But one of the main features of these tanks is their availability to people wishing to cool themselves off as they enjoy the attractions of their time on farm. The tanks are also used to cool fruit prior to meals, acting as a natural refrigerator. The abstraction of water from the wells around Qatar has brought increasing salinity. Although the government requires licences for those using wells, it has not been able to prevent the slow increase in salinity of well water with the steady influx of sea water, particularly near the coast. In addition, the policing of abstraction has been difficult to carry out and enforce. At the same time the rapid development of urban settlements has meant that land has increased in value significantly. This has made the land on which palm farms sit too valuable to ignore as a resource for the construction of buildings, with the effect that they have been allowed to die prior to being redeveloped. In some parts of the world trees are protected and permissions have to be obtained to cut them down. I am not aware of any developments in Qatar which have been able to retain some or all the palm trees as a resource for those living and working in those developments. Instead, landscaping is carried out from scratch and with a plant palette which is not always based on native species, something the government has attempted to confront. Militating against this desire have been the commercial pressures from the nurseries who, responding to the demands of an expanding consumer base, as well as a commercial desire to offer a widening palette, have introduced an increasingly broad selection of materials from outside the region. This photograph demonstrates that there is often no discernible design in planting within private gardens. the availability of water in quantities which were previously unimaginable. It is also possible that there was a resistance to planting in public areas even though there are well-defined controls for operating in the public realm, and for the public good. However, I suspect that the absence of water has been the main difficulty. One of the consequences of the above is that, in the old towns and villages, there was no public planting. If there were any plants at all they were tamarix, acacia – a thorny, straggly tree which is able to exist with very little water, mimosa – a form of acacia with yellow flowers to which some are allergic, together with some of the small plants that are able to grow in marginal locations – similar to grass in the West, though much more sparse. To give some idea of what trees can be commonly seen, the photographs above are, from left to right and top to bottom: tamarix, cupressus, mimosa; and ficus nitida, washingtonia and phoenix dactylifera – the date palm. Conditions in the Gulf are, and were, relatively simple and harsh. The first use of the courtyard with regard to landscaping was for the provision of productive planting – for fruit and shade. Date palms were usually the first planting within a courtyard but I have also seen oranges and lemons there as well as ficus even though there is no product from it other than shade. I have also seen bougainvillea which I suspect was used as it is relatively hardy, is colourful and has a degree of security associated with it. Here you see some more common sights around Doha. In Umm Salal Muhammad the housing seems to have been in relatively small plots, perhaps because they were optimised in order to retain use of the areas of valuable rawdha or sweet soil. This provided areas given over to structured planting with date palms in irrigated rows and below them, I believe, plants such as melons were grown with, perhaps vegetables in their season. What, I don’t know. Over a period of time houses, which have traditionally been the main component of the Arabic urban scene, have increased their size and moved away from a courtyard character to the villa type with the house being in the centre of the plot and with a peripheral area available for a number of uses including planting. In many of the new houses, the opportunity provided by the area surrounding the house together with the availability of water, has witnessed the considerable planting of trees lining the boundary wall. They are now a strong feature of the urban landscape, softening the hard lines of boundary walls and buildings as in this photograph, taken in 1987. At this remove there are few people who would recall how this differs from the lack of planting characteristic of the traditional urban developments of the peninsula. The photograph above shows the corner of one of the areas left open in the laying out of the housing in the Senior Staff area of the New District of Doha. There was always the intention that these areas would be developed by landscaping or for community benefit and not left empty with the likelihood of becoming a problem from tipping and other practices. But one difficulty was the ability of the Municipality to look after these areas, but in some cases this was dealt with by local property owners taking responsibility for landscaping them. In this example, the beginnings of planting the corner plot has begun with, I believe, local rather than Municipality activity. The bougainvillea cascading over the neighbouring wall is an attractive backdrop to the corner plot. By contrast, the opportunity presented by this corner plot has been embraced by the local residents to adopt the area and install play equipment for children. It may not have been the most exciting children’s play area, but it fulfilled a number of functions and, hopefully, would have been improved over time. This photograph dates from the mid-1980s. Note the typical pre-cast concrete column and walling units created for the Senior Staff housing project. With regard to decorative plants, bougainvillea, oleander, hibiscus and jasmine were common in the area, and still are and can be seen all over the country both in the public and private sectors. One of the reasons for this is that gardeners tend to share the plants under their care. The result is that there appears to be a small, common palette of plants used on the peninsula. Hibiscus presents usually as a deep red flower against dark green foliage. Bougainvillea makes a vivid and attractive presentation – though often on the other side of the wall against which it’s planted – and has the additional advantage of providing a high degree of protection through the density of its branches and thorns as well as being useful as a shade plant. These three characteristics can be clearly seen in the upper of these two photographs. There is a good case for encouraging bougainvillea planting in this manner as it brings considerable attraction to the street scene through its soft form contrasting with boundary walls, its colour and movement. It grows quickly and has a flower head that many find attractive, though not, perhaps, as much as single-headed flowers such as hibiscus. Commonly oleander presents in Qatar as a white or pink flower, nerium oldeander, with long green shiny leaves, as in the upper of these two photographs. It is to be seen as a large bush all over the country both in private gardens as well as public areas with its flowers creating an attractive display. But it also presents with yellow flowers, thevetia peruviania as in the lower photograph. It can be said to serve no real purpose other than show. Additionally, oleander it is poisonous. Jasmine, on the other hand, is likely to have been selected not only for its looks, but particularly for its perfume. It is lovely to come across it at night and, bearing in mind how sensitive Qataris are to smell and taste, I can understand why it has become popular. It’s probable that the relatively small amount of planting had much to do with the lack of water to feed relatively unproductive plants such as floral bushes. In addition to the shortage there would have been, in the towns, a problem with the high salinity levels. Nevertheless, date palms and bougainvillea were relatively common in Doha as were mimosa and the ubiquitous acacia trees which establish themselves relatively easily. Planting was generally peripheral to the courtyard and, together with the usual collection of chickens and pigeons, tended to lend an agricultural appearance to at least a part of the courtyard unless the developed site had more than one external courtyard, in which case there was a tendency to have one of the courtyards developed to production, the main one being more recreational in character. I understand that there was vegetable planting in the past, though I’ve not yet been able to quantify it. The traditional dishes of Qatar featured at least onions, the additional spices being bought in from the nearby suq, as would have been rice and the wheat used for the flour which was ground for bread and presumably any vegetables that were needed such as peppers and limes. But the knowledge of suitable plants would have been available as would the plants themselves. Oranges, lemons and limes were grown as were, I’m told, bananas and melons. In fact I can remember a banana tree being taken down in the nineteen seventies and being told it was the last one in Doha, though I also remember doubting it… There are certainly a few banana trees now as well as considerable vegetable planting. I don’t know if the initiative comes from the house owners or from the gardeners who come, in the main, from the Indian sub-continent and seem to have a love of all forms of planting often, as has been my experience, without recourse to asking or listening to the wishes of the house owners. through the Red Sea and, after its opening in 1869, the Suez Canal. Nowadays basic vegetables are grown in many gardens and I believe this replicates traditional practice. Both Qataris and ex-patriates grow for their own use and, in the case of the larger gardens, produce vegetables that are given to family and friends as there are surpluses in season. Nor do I believe there were many – if any – formal, landscaped gardens in Qatar. This may well have reflected a consequence of the need to give private spaces over to the necessities for running the household. It’s perhaps understandable in the desert developments, but it might have been anticipated that, with the strong influence from the other side of the Gulf, there would have been the type of courtyard design associated with the towns there. But, perhaps not. Those courtyards made considerable use of water, often in the form of reflecting pools; but such use of water tended to be related to dry climates, whereas the climate of the littoral of Qatar is humid maritime. In such a climate it is, perhaps, unlikely that an attempt would have been made to increase humidity with its attendant decrease in comfort. All this changed in the seventies with the first public garden established between the ‘B’ and ‘C’ ring roads south of the centre of Doha, the Al Muntessah gardens. This had become possible with the improving production of water in large quantities. Initially some of the water used for irrigation was produced from deep well extraction, a process that has always been an issue but difficult to control due to a number of factors. But with problems caused by the increasing salinity created by well water extraction, the water was mixed with desalinated water to reduce the effect of salt build-up in the soil and consequential damage to the planting. For a number of reasons this wasn’t too successful due to the concentration of salts on the soil surface with time, but I shall discuss that elsewhere. While this example might not be considered to be public planting, it was an area of planting created by the State and in a very public place. Located at the east end of the Rayyan Road, where that road turned north, wrapping round the south end of the Diwan al-Amiri, a garden was started between the southern entrance gate and the Rayyan Road. This garden was created when there was little in the country to base it on. As a consequence the garden has a considerable amount of grass with, on its periphery, acacia trees. A small amount of low level planting has been incorporated, I understood for security reasons. I don’t recall it developing into a mature garden, though I do have memories of considerable watering. In the eighties or nineties this policy was changed to water obtained from sewage treated effluent. This water was safely produced and its use managed with all the tankers supplying the water being marked to ensure none was delivered to houses needed potable water – this was a time when many houses were being supplied by tanker as the mains distribution system was unable to keep up with the demand from the development of new housing areas on the outskirts of Doha, and elsewhere. Along with the parks, planting was introduced on the public roads. Where new roads were wide enough to incorporate medians, trees, grass and low planting was introduced, and a similar policy was adopted for roundabouts. Nowadays many of the roundabouts have sculptures on them, but the initial treatment was low planting and trees as is illustrated by this roundabout. The incorporation of lighting on a landscaped roundabout made them attractive for many of the expatriate community, particularly at night where some of the roundabouts were packed with people enjoying the twin novelties of grass and light. Here, the character of the first steps in median planting is illustrated with a single specimen planted lineally along the centre strip. This developed rapidly along medians such as the second photo taken on one of the radial roads serving Doha. This is one of the later developed roads as it was relatively generous in terms of its width. I think I photographed it between the ‘C’ and ‘D’ ring roads south of the centre of Doha. Earlier developed roads such as the Rayyan Road were constrained by existing development so the central reservation could only take palms and lighting systems. Sometimes grass was introduced, the whole system being watered from tankers. This photograph was taken in the New District of Doha and shows the benefits of a more generous central reservation. Grassed, and with peripheral planting, the median was raised by kerbs designed to inhibit vehicles crossing them, a security innovation in the nineteen eighties that followed an attempt on the life of the Ruler of Kuwait. They were popular areas and were used in the evenings by many inhabitants of Doha as they could have easy access, meet friends and enjoy picnics under the public lighting systems. The casuarina trees seen above were one of the main features of the Municipality’s planting due to their colour and soft green leaves. Here, on a median strip directly in front of and to the west of the Hotel and Conference Centre, casuarina was married with low level planting of bougainvillea to give a degree of colour contrast while providing security at the verge by preventing easy access to the median. In the first photograph something of the design density can be witnessed looking straight across one of the roads but, in the second photograph, taken inside the median, the central row of palms can be seen, protected visually by the casuarina. The intent was that, in the fullness of time, the palms would be seen over the casuarina, the texture of their branches contrasting with both the colour and texture of the latter. The construction of the New District of Doha was an opportunity to expand the conceptual planting designs in the public realm. Here, in a photograph taken in 1985, plant material has been married with hard landscaping elements to control and direct pedestrians and parking adjacent to the pedestrian path that wound around the West Bay from the old dhow port north of the suq to the Hotel and Conference centre, glimpsed to the right. The Corniche was conceived as a public space to be enjoyed, in the main, for passive recreation, but it is also used for those wanting to exercise. It is a very pleasant linear park with a good relationship between hard and soft landscaping. It has proved to be extremely popular. A considerable effort is being made to institute planting in the public areas of Qatar, no more so than in Doha. This first example is located on the ‘D’ ring road and shows a surface mounted system installed to give a trickle feed to the shrubs planted there. There are also a series of palms, each surrounded by a small declivity designed to hold water. It appears that the system is designed to feed water also to the palms, a much better system than the previous one which had water tankers moved along the road watering the palms with hoses, a process that was damaging to the installation as well as wasteful of water. The lower photograph shows a ficus surrounded by a ground level installation. It is difficult to say what kind of system this is intended to be, and I would have to assume that it is there for shrubs in a system similar to that above. Black hoses are the common material used for supplying water but, as you would expect, laying them on close to the surface creates extremely high temperatures in the water within the hoses. This photograph was taken in summer and illustrates poor practice although the grass appeared not to be suffering. It is better to have water supplied to the roots of plants for two reasons. Firstly the system is more conservative of water and, secondly, it supplies water to the roots of the plants rather than to the surface where it burns off in the heat as well as damaging the plants by the action of the heated water on the plants’ surfaces. It is also preferable to water when it is cool, in summer it is suggested that pre-dawn watering would be optimal. Taken in the area of al-Bida, this photograph illustrates that, where possible, attempts are usually made to save trees where demolition is taking place, at least until a decision is made as to whether or not they might be incorporated within a new design. Here the standard method of protection is shown with a high bund created around the tree which both gives a degree of protection as well as providing a contained area for water to feed the tree, usually brought in by tanker and hosed into the bund and allowed to seep into the ground. This reflects a long tradition of caring for plants and trees, even for scrub in the desert which to many might appear to have little intrinsic value. But this care reflects both a religious imperative known as khilafah as well as a concern which those living in the desert have for the stewardship of elements of their natural environment. Plants such as these have value to those who live in the desert. In this photograph a small declivity appears to have been scraped around each of a pair of acacia trees in order to contain any water used to feed them, as well as assist in retaining sparse rainfall or the dews common at night. It is a small effort somebody has made in order to benefit their environment. The additional water resources enabled the State to begin a planting programme not only of specimen trees and shrubs, but also of floral displays, some of these on a very large scale. While there is not the height of plants that can be found in more temperate climates, there is a wide range of textures and, particularly, of colour to be found in the planting palette of the Gulf. Both private and public gardens in Qatar can have a riot of coloured flowers, attracting insects and, with them, birds; a very much changed environment from that which obtained in the Qatar peninsula only a generation ago. Traditionally, flowers have been an important element in Arabic literature, both in their scent and in their individual display as well as their being grouped elements of the gardens in which they are planted. The colours they present offer a strong contrast to the buff colours of the limestone peninsula, and are an obvious source of delight to those using the gardens. Some of those looking after gardens can be seen with a flower tucked behind their ear, for instance. This is so not just for the nationals but is particularly true for expatriates. While nationals have their own gardens, many of the expatriates working in the country don’t, though they commonly will grow plants where they live, apparently preferring plants with scent. In addition they tend to go to public areas in order to meet fellow countrymen. Forty years ago areas such as the gardens at the airport and roundabouts were the places these expatriates congregated and it was a common sight to see these areas crowded at night with men obviously enjoying these small gardens. Nowadays the practice continues though with far greater choice. But what is also noticeable is the number of families that come out to enjoy the gardens. The Corniche in particular is a real attraction in the evenings, and the gardens in the different parts of the country are well used. I should also note that one of the methods by which the private gardens were populated with plants was by those who tended the municipality gardens bringing plants to the private gardens they worked on out of hours. This tended to produce a limited palette of plant material, but it certainly assisted the dispersal of plants around the country. At the same time the State had begun to develop its public planting along many of the main roads in Doha. The favoured plants were ficus nitida or retusa and the date palm which were established at regular intervals along many of the roads. In the top photograph you see the fruit of the palm being harvested by two municipality workers. Note the two colours of the fruit. It’s a different product from the boxes of dates commonly seen in the West, the light-coloured, unripened date being fibrous compared with the dark, ripened, softer fruit. Arabs like to eat them when the dates are half ripe, the ripeness extending from one end, so they can enjoy the different sweetnesses and textures. In the lower photograph you can see dates in a wider range of colours and states of ripeness. The concept of private gardens is common in Islam and the Arabic world. However it has not been developed in those parts of the Gulf where there was poverty and when subsistence was the imperative. Where it was possible to grow plant material within the curtilage of properties there were only two types of planting found. The first was those associated with shade and comfort, generally the acacia which is found all over the Qatar peninsula growing wild and which can be seen in this photograph of an abandoned property in the north of the peninsula. The second type of planting to be found in the older properties were those associated with food, generally the date palm. In this photograph, taken within an abandoned village in the north of the country, a date palm stands beside the remaining structure of a well from which the family living in the compound would have drawn this important element of their life in the desert. I was led to believe that the village was abandoned for a number of reasons, but perhaps most importantly, the increased salinity of the water perhaps due to over-abstraction for nearby farms. The availability of water has been the crucial factor in establishing planting in private gardens. It was not until the late 1950s that water became available in sufficient quantities to allow those with gardens to introduce plants for enjoyment compared with, previously, plants providing a use or function. In this photograph planting has been allowed to climb the verandah of one of the new buildings of the fifties, creating visual interest through colour and movement as well as providing a degree of comfort through its shade. It was common to see water tankers bringing water on a regular basis to these gardens, and it was only those with influence who could assure this supply. Many of the first plants were grown to provide shade and were a continuation of the growth of trees such as acacia which established themselves naturally and were then encouraged to grow wherever they had found a suitable foothold. In this there was no tradition of geometric or ornamental planting. Plants were an unplanned, accidental benefit. This first photograph was taken in feriq al-Salata in 1983 when the process of demolishing the old housing was underway. Here a number of ficus and acacia trees can be seen to have grown both within the curtilage of the house as well as adjacent to it. This was a common pattern and was encouraged for the shade it brought. Sometimes there was an effort made to keep the trees in the hope that they could be incorporated into future development but, generally, development designs took no cognisance of these trees and schemes were established along Western design lines with a different plant vocabulary. Many of the gardens planted in the new developments springing up around Doha saw trees and climbers developed at the curtilage of the properties. In this example, photographed in the Senior Staff housing development of the New District of Doha, a car has been parked adjacent to a property wall where it can benefit from a degree of shade provided by the wall and the bougainvillea planted within the property. While not yet as developed as the trees seen in the photograph above, this type of planting is both attractive and practical as well as enhancing the local micro-climate. The pattern of accidental shade provision occurred at all levels of the social spectrum. Here, in the residential property of a member of the Royal Family, a number of trees have taken root within the curtilage and have been allowed to prosper and create shade within the wall of the property. The only drawback to these trees was the mess they created on the ground and, for some, the effects that acacia had on health due to its pollen which, for a number of people, seems to have been allergenic. But farmers, mainly from Egypt, and gardeners from the Indian sub-continent were soon providing a wider variety of species to the larger gardens, some of which plants might be considered decorative. In this photograph of the entrance to a residential complex on the Rayyan Road, palms have been used as formal planting elements lining the entrance to the majlis. This material has been supported by ficus and, at a lower level, by plants introduced for their colour and scent as well as bougainvillea along the boundary wall for both colour and additional security. Private gardens were, and still are, developed carefully with the incorporation of rawdha into the gardens. A valuable and disappearing resource, rawdha is kept to relatively small areas and in shallow depths. This photograph shows an old site under redevelopment. The ground has been excavated to about two metres and, in the cross-section exposed of the previous garden, a deposit of rawdha can be seen to a depth of about half a metre on the right, while a slightly different type of mix can be seen on the left for the date palm, to a depth of around a metre. Private gardens, for the most part, follow the character of design in the public areas of the State. The reason for this is threefold, I believe. They replicate – albeit on a minor scale of design – the planting of public areas perhaps due to a lack of imagination in the early days as well as the gardeners often working both in the public and private domains; the planting palette available for purchase was relatively limited; and gardeners tend to establish the gardens with little or no direction from the owners. There is also a significant difference between gardens established or developed by ex-patriate tenants compared with nationals as they will bring their national experience with them. Here you can see grassed areas, peripheral shrub planting – yet to develop, ficus and bougainvillea. That reminds me, I should have mentioned earlier a very strong initiative introduced by the government in the nineteen-eighties. They decided there would be a preference for planting native species rather than imported ones. Exactly what constitutes ‘native’ is a matter of some conjecture and debate, but it is reasonable to expect this, at least in public planting. There is an interesting aspect to this policy. It is similar in intent to the direction formulated around the same time – that there should be a return to Islamic architecture. I don’t recall the two policies being linked, but there is an obvious relationship between them. This photograph illustrates a different kind of garden development that appears to spring from the developer having a considerable proportion of paving compared with the usual garden, more typically illustrated in the photograph above. It will have cost the developer more to pave the external area, but it is a sensible decision bearing in mind the increasing interest government is showing in restraining the quantities of water used by households generally, and for landscaping in particular. You will see from the photograph that there appears to be considerable shade in the garden, but the notable feature is the preponderance of potted plants that bring colour and life to the garden. While restricted in growth by the root ball that can develop in the pots, this system allows a degree of flexibility in that the plants can be moved around. The only problem is the method of watering which is dealt with below, where trickle feeds are preferred – admittedly difficult with potted plants – and heavy streams of water are to be avoided due to the mechanical damage they cause. An interesting point to note is how the concrete paviors have been wetted, a common practice that helps to cool the ground but increases humidity in the air. The majority of the private developments in which communal gardens have been developed were gated and contained a significant number of houses, usually in the form of villas though, in some cases, row housing was introduced in order to obtain a higher density and, consequently, a more economically viable investment for the owner. The houses in these projects usually contain small private gardens enabling those who live there to enjoy a reasonable degree of privacy while taking benefit from the more public planting displays. This caters for a variety of national and religious expatriates likely to take up residence. In addition to the housing, many of these developments incorporated communal facilities such as a swimming pool and tennis courts, creating more features to keep the tenants safe within the gated community. However, as can be seen in the second photograph, the layouts were often just transplanted from, in this case, the United States, and pay no respect to traditional layouts nor to environmental considerations, the watering system in this case also being a poor way of treating the planting. These three photographs were taken in the 1980s on the same private estate and illustrate something of the character and quality of these developments. The planting mixes formal planting designs, usually lining the internal road system – as can be seen in both the display of casuarina in the first photograph and in the watering system of the second – while groups of plants, not all of them local, are used to mark the front of the individual houses. Considerable expense goes into the design, installation and maintenance of these gardens, but this investment is important to those who live in the developments and is, of course, amortised by the high rents charged by the owners. But it is not just the villas that have planting; those who live in the many apartments are also able to take advantage of access to windows or balconies where they can create personalised gardens, though usually with limited plant selection. Some of the first villas had planting boxes associated with their windows, but balconies provide a more accessible resource as well as being larger and enabling more impressive displays to be grown, such as that shown here. This tenant has not only used planters on the balcony floor, but has wall-mounted planters as well as using the air-conditioner as a platform. Not only do such displays personalise high density living, but they improve both environmentally and psychologically, the immediate area in which they are located. Their greatest problem usually is that they are never provided with a water source, requiring water being trailed through the apartment to feed them. Returning to the issue of plant selection, there is another consideration. In the West the changing climate is having an effect on how plants are selected and maintained. This has two important components. Firstly, the warmer temperatures are allowing non-native plants to be used to effect, increasing the palette available to designers and gardeners. The obverse side of this availability is that some of the native species are now struggling to survive. Secondly, the amounts of water required to support native plants is increasing dramatically. As the higher temperatures are causing a decrease in water availability, native species become more difficult and expensive to maintain. If the same effects apply in the Gulf – and I can’t say if or to what extent they might – then there would be an argument to incorporate species more suited to the even higher temperatures that might obtain there. Again there are two considerations for such a policy. Firstly, the plant species most likely to thrive in an extremely hot climate tend to be considered unattractive in formal situations such as planting in public parks and along roads. Species such as acacia and similar plants are thought of almost as weeds, and species such as cacti are generally small, don’t move and rarely display. I’ve heard them categorised as being boring. Secondly, the Gulf states generally believe they have the wealth to produce the amounts of water needed to support their industries and residential requirements and may be disinclined to amend present policies. However, not all areas of the Arabian peninsula have the luxury of the revenues from oil and gas. In April 2007, Yemen announced that it was running out of water and would have to consider moving part of its population out of its capital, San’a. This illustrates what has been known for some time: that climate change and water shortage is having a serious effect on national economies and living standards, and that this will become and increasing problem for hot countries. In fact, it is widely believed that it is likely to lead to war between countries competing for water resources. For centuries the areas of rawdha soils in the peninsula have been developed for farming. A number of crops were traditionally planted, but in many ways the plant material of preference was the date palm. In Qatar this was treated as a single crop whereas, in other parts of the Arab world such as Iraq, the land on which the date palms were planted was in multiple ownership, each owner planting a crop which created a microclimate under which the smaller plants in different ownership benefitted, with up to four crops being maintained in this way. Sometimes in Qatar other crops were grown under the date palms but, of course, there was only a single ownership. This photograph, taken from a postcard, one of a number issued by the government in the nineteen sixties or seventies to promote tourism, shows a typical view in a farm with the date palms divided by water channels, and grass being allowed to grow in the area between the trees. sometimes the tree was propped with canes though this is not now the practice. I am not sure why this is so. While the above notes are as I remember being told some time ago, I can not guarantee they are accurate. For a different view of the way to plant date palms, this link will take you to a description for the cultivation of the date palm taken from the eleventh century Kitab al Filaaha by Abu’l-Khayr ash-Shajjaar al-Ishbeeli. It is not my intention to cover all the plant material that can be found native in Qatar as that would be impossible for me. There is professional literature such as this which covers the area, and I recommend anybody with an interest in native plant material to refer to both this book as well as research and discover other sources for material in neighbouring regions. Eventually this part of the notes might be organised more usefully but, for the time being, I shall just place here plant material which I feel is most interesting. One of the plants which is commonly seen in the desert in Spring is not what most visitors believe it to be – an attractive plant, perhaps suited to the garden – but a parasite. Dhanoun is a root parasite which commonly attaches itself to the roots of the common desert plants, qataf and shnaan. It is to be found in the littoral salt marshes around Qatar where it grows to a height of over 300mm, and has an attractive display, its flowers ranging in colour from yellow to purple. The plant is relatively large, erupting through the sandy soils and, because of its size and the character of its display, is difficult to miss against the more neutral colours of the desert. From a neutral viewpoint it creates a definite visual focus there. Traditionally the shade of the sidra tree was a retreat for poets and scholars, who gathered beneath its branches to discuss and impart knowledge. The fruit, flowers and leaves of the sidra, whose deep roots allow it to flourish in harsh desert climates, were components in many traditional medicines. All these qualities make the sidra a beloved icon in Qatari history and culture – and an apt symbol for Qatar Foundation, which seeks to be a haven for learning and a source of comfort to the people of Qatar and the region. The sidra occurs in three forms, one of them wild – ziziphus nummularia, the other two cultivated – ziziphus mauritiana and zizphus spina-christi. My understanding is that they all have the same local name, sidra or sidr, though the wild version differs in being more of a shrub than a tree. The ziziphus mauritiana is larger than the zizphus spina-christi. As mentioned above the fruit of the sidra is eaten and known locally as kanaar and nabq respectively for the ziziphus mauritiana and zizphus spina-christi. I mentioned previously that the State is interested in using plants which are native to the region, one of their difficulties being the perceived unsuitability of some of the species which have been introduced in recent years. I have also written about the likelihood that other countries are going to have to bring in species suited to the warmer climates which are now becoming more frequent with global warming. Qatar, of course, has a hot climate to begin with and this, together with the State’s ability to produce water with the wealth generated by oil and gas, is likely to militate against a ban on foreign species, particularly in the private sector, even if the State bans them for their own use. Set out below is a list of species of plants thought suitable for the region and given to those building their houses on the New District of Doha when the programme for constructing housing began there. These species were selected for being generally hardy, salt-tolerant and readily available in the area. There are other plants which have been introduced by the commercial nurseries or by private individuals bringing in plants with which they were previously familiar. I have a number of notes that inform the subjects I write about on these pages. Generally I know where they came from, but some were put down thirty years or more ago and I am not sure of their origin. This next table falls into this category but I add it under a fair use doctrine and hope it may be of use. Some of the soils in Qatar are particularly saline, as I have mentioned previously. Land near the sea is obviously likely to suffer from inundation but excessive abstraction has also increased salinity levels some distance inland. Sea water generally contains between 30,000 and 40,000 parts per million of dissolved salts, and it has been noted that there may be higher levels in soil where evaporation has concentrated the salts near or on the surface of the soil. Following is a list of plants by their degree of tolerance to saline conditions. It is not complete but might be useful in considering selections. This, too, is a list of plants prepared for Qatar as advice on plants suited to the peninsula. Some of them are suggestions rather than plants that might be guaranteed to thrive. Again, they are listed here to inform with the recommendation that they be treated with caution. Note that there is repetition in this list with plants above. ** Bear in mind, if considering the Parkinsonia aculeata that, if it is the tree known as al-gharqad, there may be restrictions or inhibitions upon its use. As noted above, the Conocarpus lancifolius has now been, at the beginning of 2017, identified as dangerous to underground structures, and its importation, sale, specification and planting banned in the peninsula. For some time it has been in popular demand as it is inexpensive and useful in creating shade as well as being a drought resistant and saline tolerant plant. But there has been increasing criticism throughout the region of its propensity to harm underground structures. While the problems of damage can be alleviated to a large extent by its intelligent location relative to underground drains, pipes and other structures, it is true that this can not always be safely assumed or guaranteed. One of the ways in which species have been moved around the country is by the gardeners employed to look after private gardens. These gardeners have moved plants between the gardens they have been looking after, and this has resulted in a common palette found in many gardens. For instance, the Madagascar periwinkle is now commonly found all over the State, usually in window boxes where they make an attractive and colourful presentation. I can recall gardeners bringing them round and planting them, knowing that they originally came from government gardens in which the gardener had his normal work. whether there will be a need to overseed in winter, a technique adding a different grass in winter in order to maintain the colour of the lawn. A number of grasses are likely to be usable in Qatar, either individually or as a mix. Because of the importance of this element of landscaping it is strongly advised to enquire of the suppliers how the grass is likely to deal with the issues noted above and, preferably, visits should be paid to established lawns. One final note and that is that I have seen artificial turf used in Qatar in areas that were required to look good all year round, as well as take considerable activity from children. Although the initial cost can be expensive, maintenance is minimal. There is significant psychological benefit to be derived from the ability to enjoy – both visually and directly – private and public gardens. Some are lucky enough to have a private garden, but many do not have them and take advantage instead of both the formal, public gardens as well as roadside planting, particularly in the evening. It used to be a feature of roundabouts – the first public areas to be landscaped – that they would be filled with expatriate workers at night. It was also relatively common to see these workers with a flower tucked behind an ear. Gardens consume considerable amounts of water. In Qatar, there is a significant interest in developing relatively lush gardens as a relief from both the arid character of the country as well as the heat of summer. But little thought is given to watering neither in terms of the installation of a watering system nor in the process of watering. This sprinkler, for instance, was operating in the middle of a very hot summer morning. The difficulty with watering at this time is that the water heats up and can boil or burn the planting. One of the problems of developing housing in Qatar is that much of it is constructed for the rental market: the expatriates who have come to the country to participate in its development. For this reason, most house builders will design down, spending their resources with a mind on the initial development costs because they know that running costs – utilities, planting, staffing and the like – will be the responsibility of the tenants. Developing for themselves is a different matter. In this case gardens are considered, but rarely are they dealt with from the point of view of the conservation of resources as this has rarely been an issue. But, as I have noted elsewhere, both the soil and water are scarce resources and need to be safeguarded. With a little consideration there are a number of things that can be done to reduce the amounts of water used and to make the process of watering the garden easier. Much of this stems from the proper preparation of the garden. Although some housing sites are being established on old gardens – regrettably – there is unlikely to be sufficient ‘sweet soil’ to support modern planting requirements. In order to get over this owners have imported rawdha from other gardens and used this to fill their gardens. Due to the limited amount of rawdha available the Government placed a limit on the amount that could be moved though it was unable to monitor and police this practice adequately. Today it is important to plan a garden prior to planting and not, as was the practice, cover the site with an equal layer of rawdha in order to enable landscape design decisions to be made later. At its crudest, provision needs to be made for different depths of rawdha depending upon whether trees, shrubs, flowers or grasses are to be planted. which improves the water-holding capacity and is generally in gel form. Ensure that the rawdha and any admixtures are well mixed and in the correct quantities and proportions as directed by the manufacturers prior to installation. trickle systems – this is the most effective watering system, permitting accurate placement of water to the plant as root systems are generally limited to the area being watered. Where the soil is kept relatively moist and soil moisture tensions are low, salt crystallization is inhibited. being near the surface, the roots are more likely to be affected by sun, heat and wind. watering by thoroughly soaking the planting on, say, a weekly basis rather than watering lightly on a daily basis. The amount of water and the frequency will, of course, depend on the plant species and the time of year. keep the surface soil relatively cool. In order to conserve water and soil nutrients it is wise to pull up weeds or, where they prove difficult to remove, treat them with a commercial compound that will kill them. It is just as important to pull up weak plants for the same reason. Whether using an automatic, buried or hand-delivered watering system it is preferable to water very early in the morning or, better, in the evening. This gives the water time to percolate into the soil and optimise its benefit to the root systems. It is important not to water when the leaves and body of the plant are hot and if the sun is on them as this, combined with the water, physically damages the plant through the application of heated water. pop-up, this being the more wide-spread. The better of the two is the underground system of which there are a number of types suited to installation prior to the depositing of the soil and compost. Their great benefit is that they feed the water at the correct depth to encourage a healthy root system and, properly selected and installed, are less likely to suffer failures than a pop-up system. 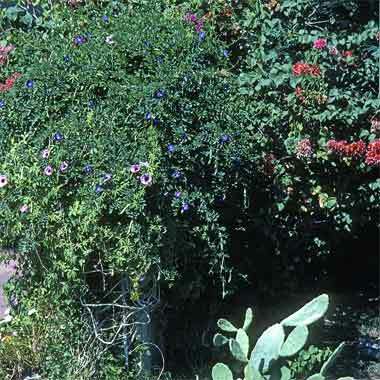 a hose pipe fitted with a spray has the benefit of occasional use in order to wash the dust from the leaves of the different plants and flowers. Water for landscaping is traditionally fed from ground or roof-located tanks and then applied to the planting with the aid of a small electric pump. It is usually the same water that is used in the household domestic water system although the Government has been using treated effluent water on its own landscaping, particularly areas to which the public do not normally have access. grey water from the household waste systems, particularly bath water. Both these water sources will conserve the amounts of domestic water needed by the site as a whole. It is possible that the quality of the water might need to be monitored and chemically balanced to ensure that alkaline chemicals from the household grey water do not affect the plants. In addition it would be wise to construct the water tank with oil traps in order to keep surface water-borne contaminants at bay. I should also mention that there are additives which can be added to water in order to benefit plants. The amounts needed vary with species and manufacturers’ recommendations, but can be useful to supplement the nutrients within the soil. Having said that there are many concerns nowadays for the use of additives for a number of reasons. Where possible, alternative strategies should be investigated. However, there are two problems that must be considered when incorporating chemicals in distributed water systems, most usually with sprinkler or hose applications. Bear in mind that chemicals are likely to crystallize on plant leaves causing scorching. Secondly, over-watering may leach away the chemicals into the ground waters. Having said that there are many concerns nowadays regarding the use of additives. Where possible, alternative strategies should be investigated with the intent to reduce water use, eliminate or reduce unfortunate consequences related to chemical additives and, hopefully introduce improved or safe novel nutrient methods. Natural methods should always be sought first. Bear in mind that the amount of watering for grass recommended above takes into account the additional suggestion in this lower table. The advice given above relates to summer requirements. Winter requirements will be lower and the systems selected should, therefore, be capable of a degree of flexibility in order to respond to the differing conditions throughout the year as well as different growth rates of the species selected. planting on slopes is likely both to create surface erosion as well as give less water to the root system. It is better to plant in terraces. You can see from the above that there are many issues to consider when installing a garden. As I have stated elsewhere it is essential that these are dealt with professionally. It is imperative that the garden and interior of the building are considered together in order that each benefit the other. It is important to make sure that the owner has an accurate drawing of all the utility cables, ducts and equipment below ground level in the garden. Not only will he need to know where things are when he wishes to make changes or in case of emergency, but his gardener will need to know in order that nothing below ground is damaged in the normal day-to-day activities associated with maintaining and improving the garden. A considerable effort is being made to institute planting in the public areas of Qatar, no more so than in Doha. This first example is located on the ‘D’ ring road and shows a surface mounted system installed to give a trickle feed to the shrubs planted there. There are also a series of palms, each surrounded by a small declivity designed to hold water. It appears that the system is designed to feed water also to the palms, a much better system than the previous one which had water tankers moved along the road watering the palms with hoses, a process that was damaging to the installation as well as wasteful of water. The lower photograph shows a ficus surrounded by a ground level installation. It is difficult to say what kind of system this is intended to be, and I would have to assume that it is there for shrubs in a system similar to that above. One of the features of both new and old areas of urbanisation is the ability of plants to find life wherever there is a source of water. Examples of two of those sources can be seen here. This first photograph, outside a government office block, shows a condensate discharge which has been led to a paved surface with the intent of its running away or evaporating. Instead a small plant has found a gap between the wall and paving and is starting its growth. If permitted to continue it is likely to cause damage to the building though, with a little thought and a different species, it might be an attractive addition to the urban landscape. This second photograph is very typical of the older areas of Doha where there is no paving of the ground and a source of water – in this case a water tap located outside a house in order to benefit those passing, an Islamic tradition – has been available to permit plant material, in this case mostly grass, not just to grow but to flourish. In the past this was used as fodder for animals and was rarely allowed to grow this high. Finally, I should mention that it is imperative a coherent lighting and security system be considered and designed at the same time that the landscaping is designed. In this way, the necessary ductwork and below-grade installations may be co-ordinated with the watering system and carried out prior to the depositing of the rawdha and installation of the soft and hard landscaping. The watering system, as alluded to above, should take consideration of waste or grey water, and any other methods for using resources thoughtfully. The issues relating to security generally are noted here as safeguarding buildings, and here with regard to the protection of buildings. This may not be the best distinction but, if you look at those two pages, you should be able to work out what is meant by each. In this section my intention is to deal mainly with the considerations owners are likely to make in order to feel safer within their site, as well as in using lighting for display. My experience is that landscaping generally, and external lighting and security in particular, are commonly forgotten at the inception of a project and not dealt with until much later, if not at the last minute. Sometimes this results in additional cost due to a need to take up materials recently laid, redesigning caused by the need to accommodate new fittings, or upgrading required to route and protect cabling. So let me repeat what must have been said elsewhere: it is essential that landscaping is designed, or at least considered, at the same time as the building. At that stage, strategic decisions can be made about the character and requirements for the building which will automatically translate into a conceptual vocabulary or direction for the external elements. It will also clarify budgeting allocations. Two of these elements will relate to lighting and security. The two areas are often considered separately but elements of them will coincide as lighting is one way of improving security to a building. With regard to safety, lighting in areas of landscaping must make provision for safeguarding those who move in and around that landscaping. This usually relates to access, paths, walkways and the like, as well as to leisure and recreation. It should identify changes in levels, particularly steps, areas of uneven or irregular ground, as well as protect people against being hurt or their clothing damaged by elements of landscaping at both high and low levels. The external areas of buildings often contain areas set aside, or likely to be used for recreation. Areas used for swimming, tennis, basketball or football are likely to have their own lighting systems designed to produce an even spread of light over the playing area. But children and adults will often play games on other areas. Lawns and service areas are commonly used in this way and it is sensible to have a lighting system that may be switched on specifically to enable those using the areas to do so safely. With regard to security issues, lighting is generally located in such a way as to make possible threats apparent. In effect, this means that it should be designed to make people or vehicles visible. In this sense the designer should consider an apparent threat being made visible to those outside as well as inside a compound. Lighting needs to be designed and positioned in such a way that people or vehicles can be seen against a clear background, either in detail or silhouette. Often this conflicts with a client’s requirements. Many buildings are floodlit to demonstrate them to the outside world. Although this may help those outside a compound seeing an intruder against a lit wall, the converse is usually that it is difficult for anybody inside a building to see when looking into the light. One of the key differences with lighting for landscaping is that the positions from which the landscaping will be seen are relatively fixed, the main emphasis with residential and many other buildings being on the landscaping being seen from openings within the buildings, or from external leisure and recreation areas at night. Commonly, lighting associated with landscaping tends to be designed to illuminate specimen plants, particularly trees, and generally by uplighting. Sometimes form is brought out in planting by using strings of light draped across it, a commonly seen lighting display associated with celebrations such as weddings, national celebrations and eid. One of the difficulties with soft landscaping, from a lighting point of view, is that plants grow. This can obscure planting with time and create shadowing effects, so this factor has to be taken into account when designing lighting layouts. When designing a lighting programme, perhaps the first thing to identify is the mood required for the landscaping. The benefit of artificial lighting is that it can be changed. Not only can colours be altered, movement can be created both in terms of direction as well as colour. Additionally, and obviously, lighting can be turned on and off. The colours selected, the degree of focus and their intensity will suggest a lighting mood for the landscaping, and this may be magnified or reduced by programming the lights to perform sequenced displays.